Today, the President of Biprogeo Projekt Sp. z o. o. received the Letter of Congratulations from the Voivod of Lower Silesia in recognition for the achievements of the Company in respect of the promotion of ethics, honesty, reliability and timeliness of economic activity in Poland. 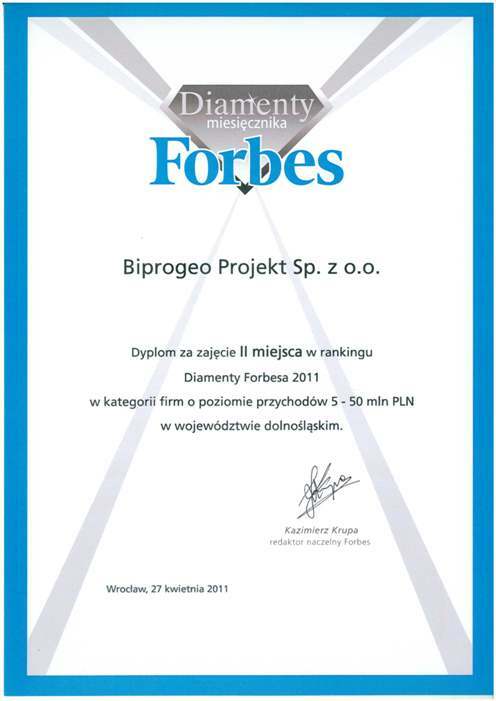 On 17 November, 2010, the Wroclaw Chamber of Commerce awarded Biprogeo Projekt with a Silver Certificate of Credibility and Reliability within a framework of the White List program, stating that our company has all necessary attributes of credibility and reliability, and enjoys an impeccable reputation. 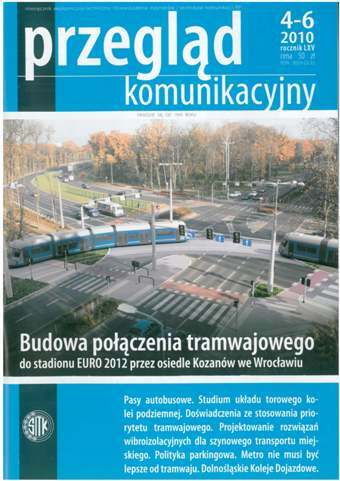 The latest issue of Przegląd Komunikacyjny – a monthly economic-technical magazine of the Polish Association of Engineers and Technicians of Transportation - was released today, with an article written by a team of designers of our company - Marek Jagiełło, Jacek Makuch and Michał Korban: "Construction of the tram connection to the EURO2012 stadium via Kozanów housing estate in Wroclaw. We invite you to read it. 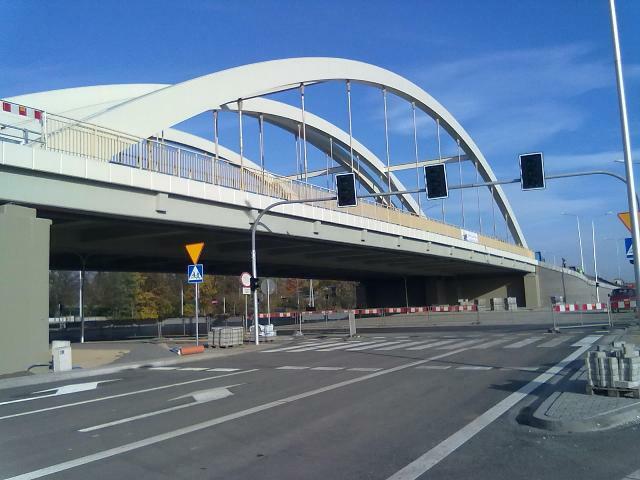 A grand opening of the North Inner-City Bypass of Wrocław from Osobowicka Street to Poświęcka Street took place today. Our firm acted as the Main Design Unit of the investment whose value amounted to PLN 257 million. The investment was implemented in the "design and build" system. Skanska was the general contractor of the project. 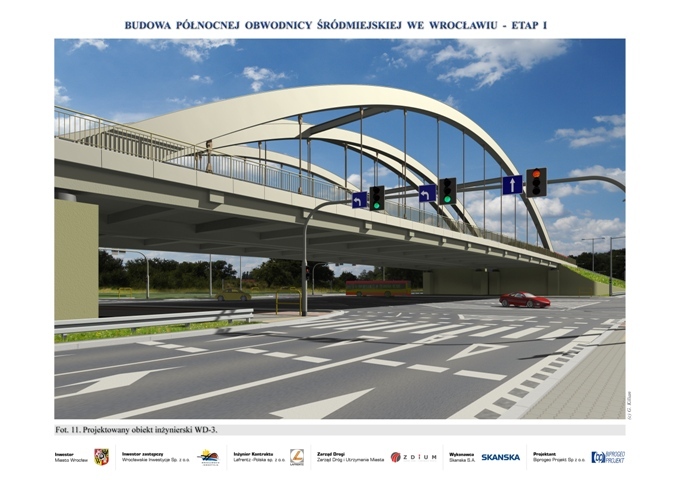 The length of the designed section of a dual carriageway bypass was 4196 m. Also a double-lane section of Żmigrodzka street was rebuilt on the length of 780 m and a section of Obornicka street on the length of 220 m. We designed one roundabout crossing in the course of Obornicka Street and one intersection in the course of Żmigrodzka Street. 110871 m2 of bituminous pavement was built during the investment. The volume of earthworks totalled to 586 thousand m3 of embankment.